Who doesn’t love blowing bubbles? It’s so fun and takes you back to the lazy summer days of childhood. Personally, I love bubbles as wedding favors. It might seem “old fashioned” to some, but we passed out bubbles at my wedding and some of my favorite photos are of my husband and I walking out of the church surrounded by tiny bubbles! But enough with the nostalgia! 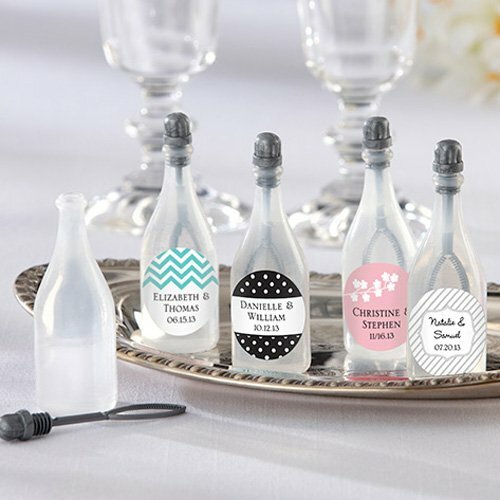 Let’s talk about these super cute personalized bubble bottles. You can choose from 14 different label designs (including zebra print and chevron!) and 16 different colors so it’s almost a guarantee that you’ll find something to match your wedding theme. Bubbles can be passed out after the ceremony or at the reception – they would be especially fun for an outdoor reception in the spring or summer. And they’re a less expensive favor than say, edible favors. You can find these personalized bubble bottles here.